June 22nd is fast approaching, which means that War for Cybertron will soon be sitting in my Xbox 360. There is a demo on Xbox Live right now showing off the multi-player! 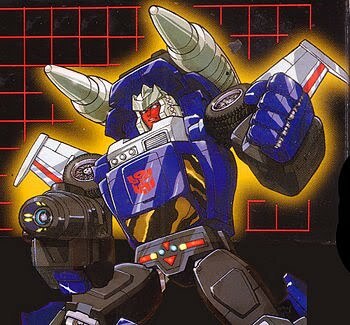 To celebrate the game’s release I’m counting down my top five favorite transformers as a kid. Thundercracker and Sideswipe were numbers five and four. Both characters came out in the initial release and are both confirmed to be in War for Cybertron. Sadly they are the only two characters on my list confirmed to be in the game. My next two picks in the countdown were released the year after Transformers US debut, 1985. So the Transfomer we’ll be talking about today is the Autobot, Tracks. Tracks’ vehicle mode is a blue Corvette Stingray. While I still appreciate Corvettes now, as a kid I loved them. Corvette pictures on my wall, Corvette Hot Wheels cars, and then a Corvette Transformer. The moment I saw him, all of the other bots who had come before him were forgotten. But there was so much more to the toy to love and then there was a crushing disappointment afterwards. More love and disappointment after the jump. 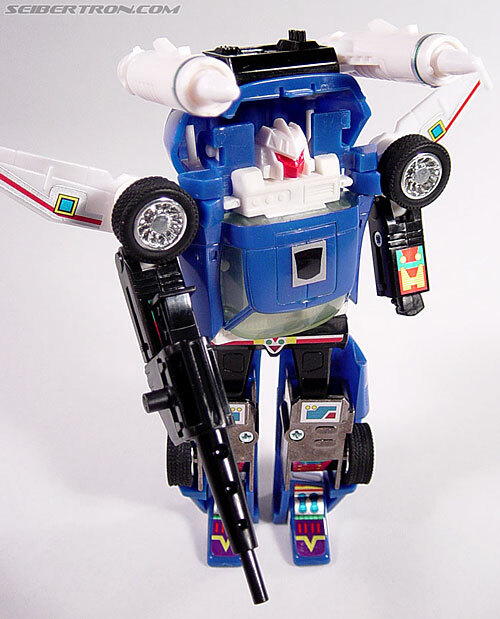 Called “lousy Earth-lover” by some fellow Autobots because he prefers sleek Earth car forms to original robot form. 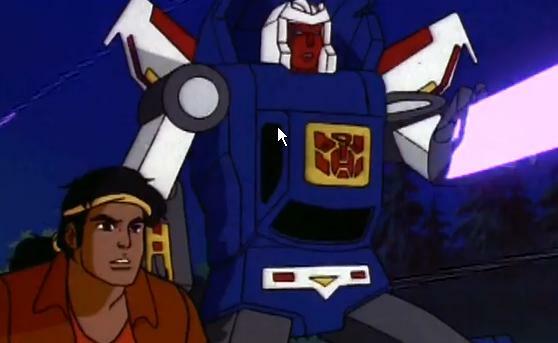 Thinks they’re jealous of his good looks but they feel struggle against Decepticons should be his top concern. As car goes 280 mph…uses wings under rear fenders for sub-sonic flight. As car or robot uses launcher to fire heat-seeking incendiary missiles 60 miles. Has blinding black beam gun. 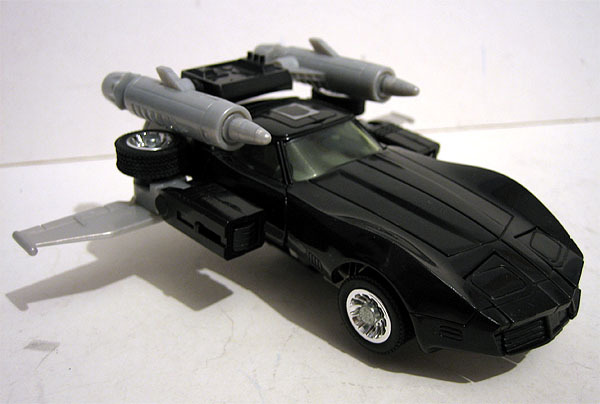 Tracks came with a black beam gun to use in robot mode. He also had a missile launcher mount that could hold two missile launchers. And here is where it starts to get really good. The missile launcher mount still connected to Tracks when he was in car mode. So not only could I drive him around the floor as my favorite car, I could shoot missiles while I was doing it. Tracks wasn’t just a missile shooting Corvette though. He was flying, missile shooting Corvette. In car mode you could fold out his arms and wings and you had what might have been the coolest thing I had ever seen as a child. You would think a kid would be lucky to just have one flying Corvette toy in his life, but I was lucky enough to have two. I year later MASK would come out with Raven, a Corvette that turns into a Sea-Plane and shot saw blades!! 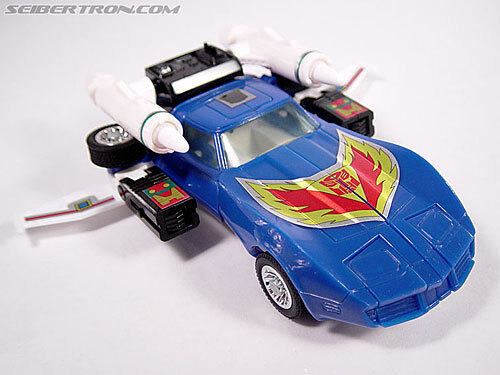 So Tracks had a stunning car mode, two missile launchers, and this awesome flying car mode. What could possibly stop this from being my favorite possession ever? Go back up and read the quote from his file card. I’ll wait….. Back now? Yeah. He’s a narcissist. No big deal I can ignore it. Right? Then he started appearing on the cartoon. The voice actor says he was going for a Jim Backus type voice (Thurston Howell on Gilligan’s Isle). Many fans accuse him of being gay. I just found him snobby and annoying. Befriending the local Latino street gang didn’t do anything to change how he acted. Yup, the stuck up Transformer was teamed with a Latino street gang. I was crushed by how much I hated him on the show. Why couldn’t he just fire his laser gun in the background like Sideswipe? Eventually I found that character that I loved on the cartoon and in toy form, but you’ll have to wait for number one on the countdown for that. Despite his cartoon appearances Tracks as a toy is still one of my favorites. The re-issue a few years back sits on one of my shelves next to the Alternators version. I recently found out there was an ultra-rare black version that came out. I’m not ready to spend hundreds of dollars on it, but damn I’d like one. 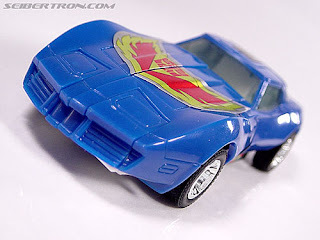 Also, almost all the pictures used in today’s list are from seibertron.com which is a great site for Transformers fan. You should check them out. Expect the countdown to finish up next week, hope to see you then.